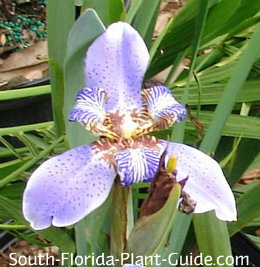 The beautiful irises of South Florida include African, walking, blue flag, and one called blackberry lily. These striking plants make great accents for their foliage alone, but all have exquisite flowers as well. 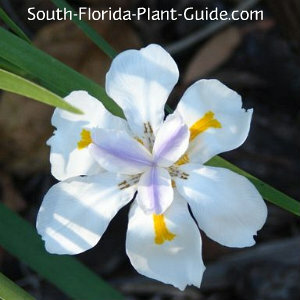 African Iris (Dietes vegeta) - also known as "Butterfly Iris" - is probably the best known in South Florida landscapes. Its thin, willowy, upright leaves grow in a clump that forms a grass-like mound about 2-1/2 feet tall. Walking Iris (Neomarica spp.) is so named because, as the flower stalk gradually leans low to the ground, it roots and "walks." These plants come in flower colors of yellow, white and blue. Especially beautiful is the lavender-blue and white blossom of the cultivar called Apostle Iris. They bloom on and off during warm months, growing to about 3 feet tall. This plant is similar in looks to African Iris, but with wider leaves..
Blue Flag (I. virginica) blossoms in spring with gorgeous flowers in a vibrant lavender blue. 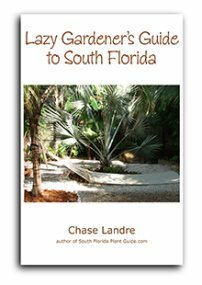 It's a native plant to Florida (and much of the Southeast U.S.). Blue Flag grows about 2 to 3 feet tall, preferring part shade. 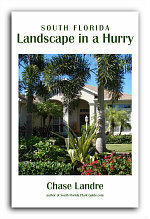 This is a good choice to plant by a pond since it will grow in very wet areas. 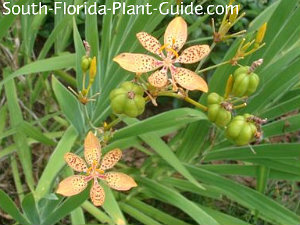 Blackberry Iris (Belamcanda chinensis/Iris domestica) is often called "Blackberry Lily" because of its flowers look more like lilies than irises. This plant does best in part sun to part shade. It sends flowers up on thin stems above the wide leaves, growing to about 2 feet tall with flowers reaching about 18 inches above. When a stalk finishes flowering, it produces seed pods that open to reveal little black "berries." Then it slowly turns brown. Cut off the browned stalk all the way to the ground to tidy up the plant and let new growth take over. Blooms are a soft orange with reddish freckles, though a newer variety with brighter multi-colors has been recently introduced. These plants will grow in full sun but seem happiest in part sun to part shade. Growth rate is moderate. Heights vary by variety, averaging 2 to 3 feet tall. 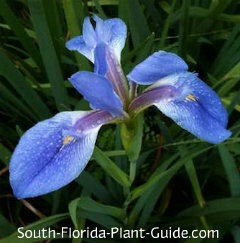 Blue Flag and Blackberry Iris are cold hardy, growing anywhere in South Florida. The others prefer the warmth of Zone 10. Though these plants will spread they don't do it in a hurry, so you can remove any shoots that are going places where you don't want them. Though they like a good bit of moisture, it's best to place them in a well-drained area (the exception is Blue Flag, which can handle very wet soils). 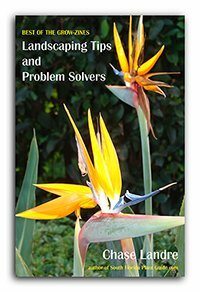 Trimming is usually necessary to remove any browned leaves and spent flower stems. Cut these as close to the ground as you can. Avoid a complete cutting back of the plant, however. You can also deadhead if you like, especially with the walking variety to limit its spread. Water is very important - they need a regular drink and don't mind "wet feet" occasionally. COMPANION PLANT SUGGESTIONS: In a part shade area, try downy jasmine, tibouchina grandifolia, firespike and pentas.